I have one small thump today. I’ve been stitching away in the evenings, stitching down the binding on my storm at sea quilt. I rounded the third corner last night, so pleased with how good it’s looking, only to notice a funny looking spot in the binding fabric. Upon closer inspection, I discover it’s a small slit in the fabric. Great! Next, I start looking to determine how much I am going to have to detach, so that I can replace that piece of binding, when all the way down that edge, and around the last corner, I see a snag in the binding fabric. Of course, both of these flaws are on the outside of the binding. Couldn’t have landed on the part that’s going to be closed up into the quilt, nope, right on the outside layer. So instead of stitching, I’m now unstitching. I don’t like unstitching. I like the doing part of quilting, not the undoing. Oh well, like I said, small thump. Minor setback. Just an aggravation. I have had a few write and ask me about my test results. I meant to post about that Sunday, and forgot. I have nothing really new to report. I never heard back from my doctor, so I went to the hospital and got copies of my reports and read them myself. The MRI on my c-spine, mentions some “concentrical disc bulging” and some “mild facet degenerative changes and hypertrophy”. I think the one on my brain was fine, except they said in the report they injected me with contrast dye, which they didn’t. Called the hospital about that, to make sure it was really my brain…lol. I think that’s probably just a med. transcriptioner mistake…you know, just automatic verbage that they didn’t delete. The only thing that I could pick out on the blood work was the high red blood count, that the doctor mentioned when he did call me, but the followup report test didn’t seem to show anything unusual. The lupus test and hormone results were on the same report. That report had me listed as a 42 year old male. Soooo….not sure what I think of that. I haven’t called the lab…I was pretty disgusted at that point, and fed up with the whole ordeal. In the meantime, I have been having my husband, or son, whichever is handy, apply some pressure to the muscles around my shoulder blade, to keep working on those pressure points between massage appts. And, I’ve been putting an ice pack on it every night while I’m sitting in bed stitching and watching t.v. I don’t know if that is making a difference or not, but I have felt much better this last week. Much less pain in that area. It’s been great to have some relief! And maybe it’s because some of you have said prayers for me. Thank you for that! I believe in the power of prayer. I’ve been saying them for me, too. I felt even better after my massage therapist, and chiropractor got through with me on Tuesday. I’m starting to think that maybe a lot of it is repetative muscle injury. Maybe from being on computers too much all day, and those muscles back there are getting screwed up, and pulling everything else out of place. I’m not giving up on getting better. That is why I haven’t been blogging as much, though…I’m trying to lessen my time at the keyboard and mouse. I finished the quilting on the Chinese coins baby quilt. I worked on it during lunch Monday, and after I got home. I’ll post pics of it when I get it all finished. It came out really cute, though. I have gotten two more rows of the first memory quilt finished. 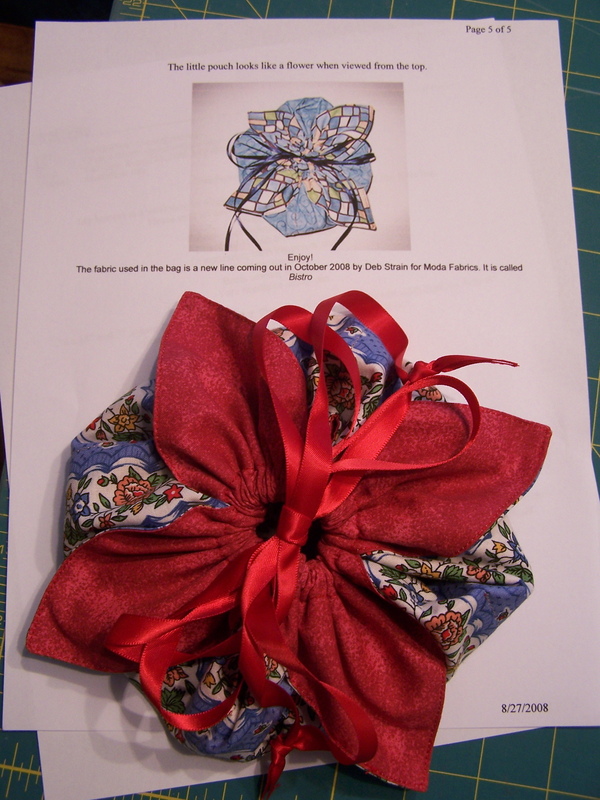 And I found this great tutorial , on Debby Maddy’s blog, while blog surfing. Thank you for sharing it, Debby. I had fun giving it a try, and I think this is a great gift project. I am sure I will be digging through my fabric stash to make a few more of these. So how is your week going? Have you taken time to do something you love? That’s a cute little gift bag. I have been packing for Craft Week all week! Sorry to hear about the un-stitching! That can be aggravating, especially right when you think you are on your way to totally finishing a project. Thanks for the link to the little bag project – I love it! I am going to have to make me one!!! Hahaha – Randi, you are definitely over-estimating me. Garment construction and I don’t go well together either. I haven’t given up so far – but one thing I can tell you is that, there is no doubt it’s been an uphill battle! 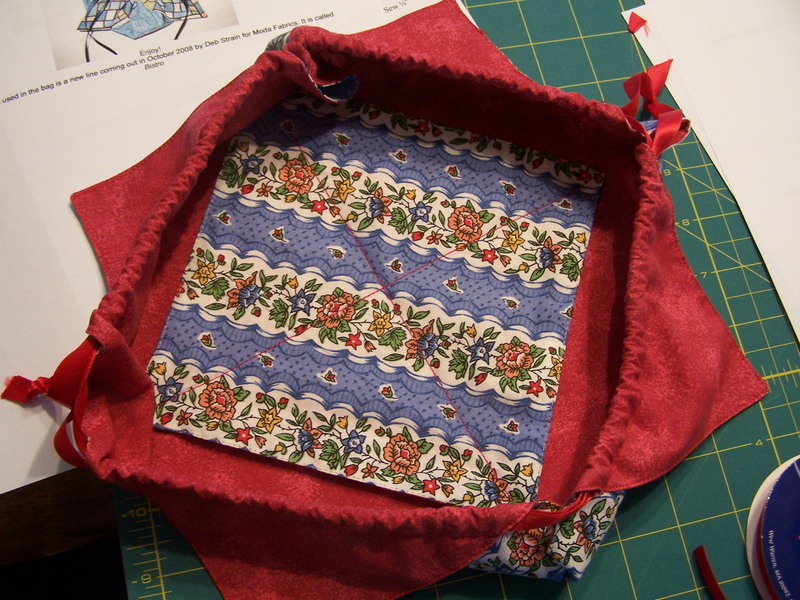 I feel for you Randi…I spent a part of today frogging too…only quilting stitches…ugh! Glad you are feeling better…but your experience with testing does leave one wondering…..
Discouraging about the lack of professionalism in regards to your test results and documentation. Also rotten about the need to frog the binding. Ooh I hate when medical people don’t call you back. And I hate when your files are wrong! I am dealing with some of that, myself, just without the physical pain! I’ve been having problems between my shoulder blades too, and the physical therapist really messed me up! Deep tissue massage shouldn’t be done to a client who has no massage experience! Nerves were bound up and pinched for days! I do find that putting a tennis ball or baseball between my back and the wall, then rolling around on it, releaves a LOT of the tension in my back muscles. I always pack a tennis ball in my luggage, too! I hope you are feeling better very soon. I know it makes me miserable, so I feel for ya! Sory you are having to frog Randi, there is no fun in that. Hope you are feeling better and have a great weekend. wow, I think I’d be chewing someone’s ear over these medical “oopsies” on your records! That is inexcusable–you go through all the effort and expense to take the tests, and they can’t keep their records straight?? Grrrrrrr. Ok–calming myself down. My excuse for my low tolerance for medical stupidity is that my DD was what they callled a micropreemie–born at 25 weeks and weighed 1 lb 10 oz. I was a bulldog when it came to ensuring that anything that had to do with her care was letter perfect and that I was informed about everything–guess I haven’t been able to shake that off yet! Have a lovely holiday weekend–glad that massage and TLC seem to help–keep being good to yourself! sorry about the unpicking…i hate that too. glad you are feeling better though it doesn’t seem like all the medical stuff is making any difference. « Just Us Quilters – Where did it go? ?